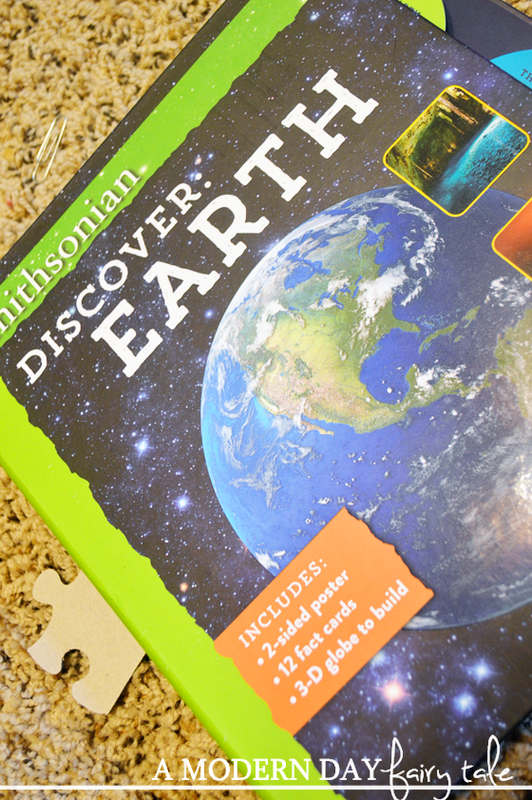 Beat The Summer Boredom with a Smithsonian Books Mega Prize Pack Giveaway! For many, summer is quickly drawing to an end...as the remaining days of summer decrease, I have found my child's 'I'm bored' moments are increasing (especially with the excessive rain keeping us indoors!). 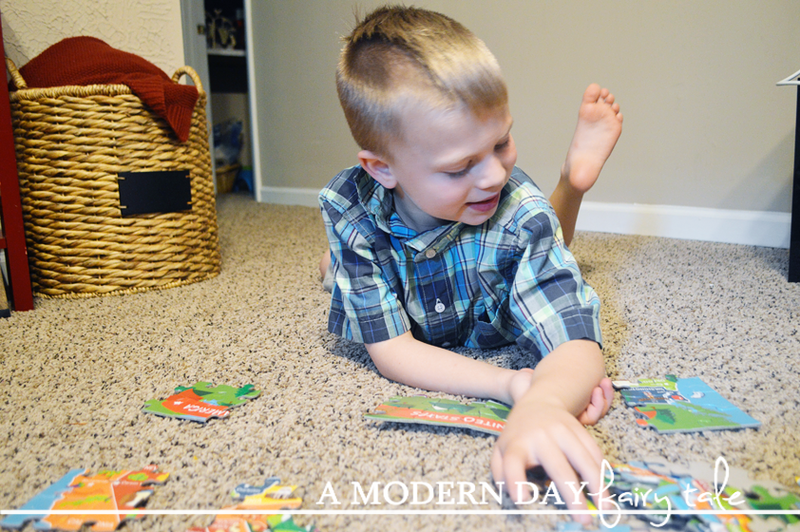 I find myself looking for more ways to keep him entertained without relying on electronics! So, when I was contacted about the new Smithsonian Books available from Silver Dolphin Books, I knew that these would be the perfect solution. The Smithsonian Sticker Creations line (ages 6+) – Dinosaurs and Under the Sea – engage young readers with an innovative, hands-on approach to learning. 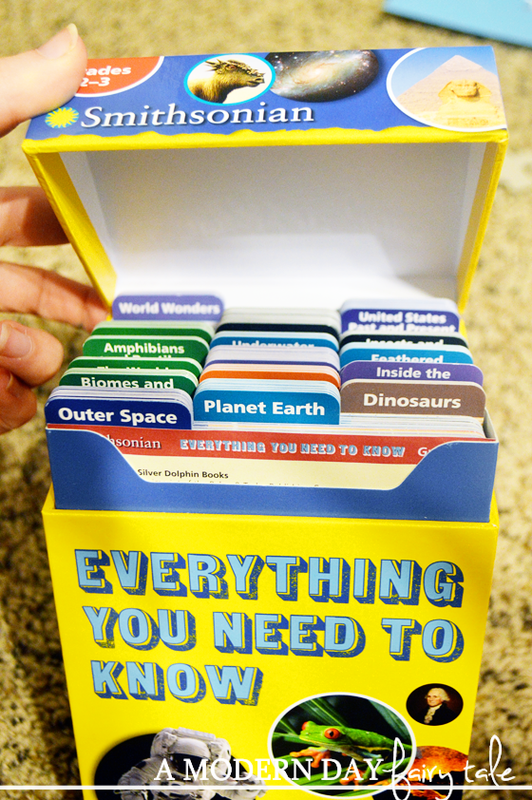 Each book presents fun facts about dinosaurs and sea creatures in a child-friendly manner, backed up by the experts at the Smithsonian, and comes with more than 175 reusable stickers plus 5 oversized 3-D stickers, and a pull-out framed play scene, allowing children to create their own prehistoric dinosaur scene or ocean floor adventure. What kid doesn't love stickers? I know mine certainly do! These fun books were perfect for them! It gave them the fun of stickers over and over again! But it also allowed my son to learn more about dinosaurs and sea creatures in a fun, interactive way. Of course, dinosaurs are huge right now, so he particularly loved learning more about them! This was certainly a favorite here! The Smithsonian Everything You Need to Know Fact Cards series, divided into Grades K-1 and Grades 2-3, is specially tailored for inquisitive minds of different ages. 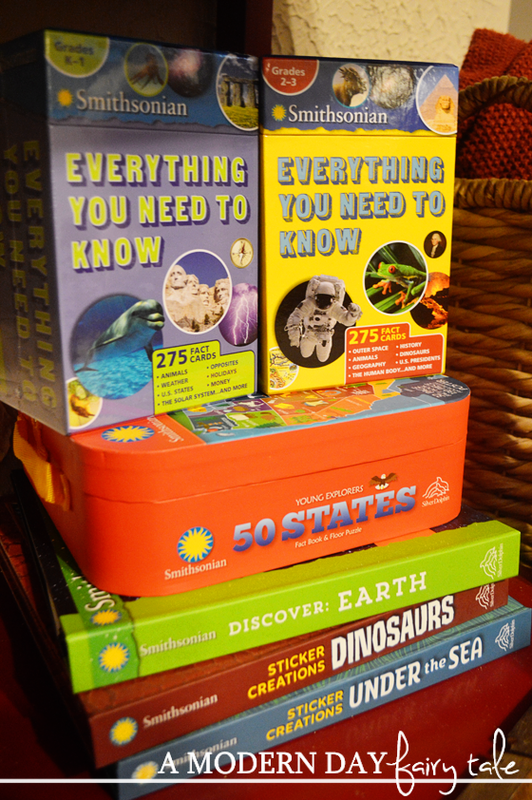 Each box includes 275 fact cards featuring categories that range from space to history to health, chosen to compliment the curricula for each grade level. The facts are paired with beautiful color photographs, illustrations, and diagrams that will capture young imaginations. Now, if I were being 100% honest, my little guy hasn't shown a ton of interest in these cards just yet (I suppose they don't seem as exciting as the other options), but I absolutely loved them! They are probably MY personal favorite. 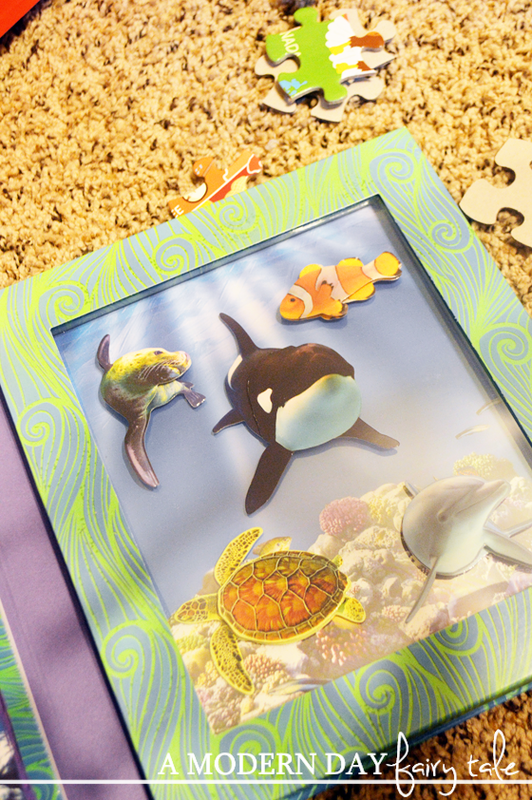 They are packed with lots of quick facts on subjects that are perfect for those grade levels. Now, my son has already passed Grades K-1, but I love that these will provide that quick little reminder on the topics he's already learned. I look forward to using the Grade 2-3 cards to help him in the next few years to expand his school lessons at home. They feature some of his favorite subjects- like science (space and animals) and geography in a quick, easy to understand format! I love the tabbed organization as well. Having a two year old as well, we have already discovered just how handy those are for keeping everything neatly organized by category! Smithsonian Young Explorers: 50 States (Ages 6+) comes packed in a sturdy travel case with an illustrated poster and a giant 130-piece floor puzzle of the United States. The alphabetically arranged fact book details state birds, animals, flowers, famous residents, and other fun trivia. As I said, my little guy loves geography and is all about maps, so this puzzle was right up his alley! Not only was the puzzle super fun and colorful, but we loved learning about all the different states, including our own! It goes beyond just learning where each state is and their capitol, but also teaches us the state birds, flowers and other fun facts! Very cool and another favorite here! In Smithsonian Discover: Earth (ages 8+), young readers will learn about the amazing animals, vast oceans, and wild weather that make up the planet they call home. The comprehensive guide comes with 12 fact cards, a large two-sided poster, and a 3D paper globe for children to construct. As I said, I think one of the best ways to get kids interested in learning is by making it a fun, interactive experience... and this book certainly fits the bill! A paper globe? How fun is that!? We loved learning all about our planet- from topics like the solar system and gravity to atmosphere, climate and landscapes, to water and even weather! This book is packed full with fantastic information on all things planet earth! And we love it! This looks like a wonderful thing to give to my son! My grandsons would enjoy these, especially the dinosaurs! Wow!! What a great prize pack!! So much cool science learning stuff!! Love!! My kids would love these books and puzzles. They are both so educational minded. My boys would LOVE these books!! I love that they are so interactive and really bring learning to life in a hands on way. This would be a great addition to our little homeschool. 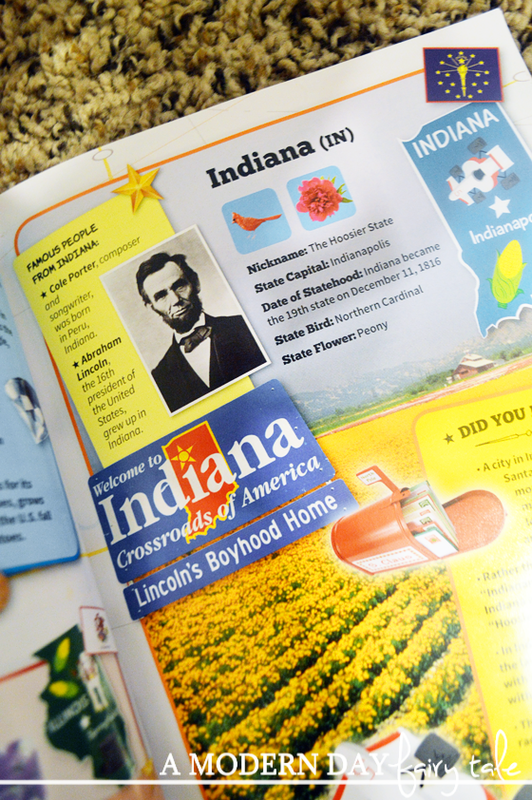 My son would love the 50 States Facts Book and Puzzle! He's really into maps right now. Thanks for the chance and I love the products. My little ones would love this, and I love giving them educational things. My son would love this. He loves anything educational. Thanks for the giveaway! I've been trying to win one of these prize packs forever, maybe this is my lucky time. Wow! What a great giveaway! My grandson would learn something new everyday if I won this! My grandson would just love all these. Thank you for the entry. My child would love to have these books. They look extremely interesting. My family would enjoy these so much! We love to learn!